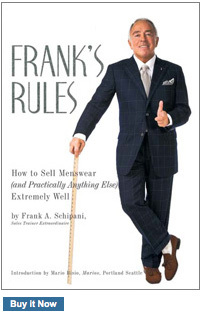 Frank’s Rules will make your life in sales easier and more prosperous in income. The anecdotal stories are rich, colorful, and applicable to living and working successfully. The underlying principles of the book, although originating from Frank’s menswear experience, apply to being professionally prepared for whatever you do. After all, you are selling all the time—you sell your lover on having a lasting relationship; you sell your children on getting good grades, not doing drugs, being good citizens and having good values. You sell your company on viewing you as a tangible asset to their business. You even sell the waiter on giving you a choice table. Wherever you go and whatever you do, you are selling as long as you are ‘living’ in this world! Frank’s Rules are meant to be ‘broken’—that is, the reader takes the information and utilizes it in his or her own unique way, to the ultimate best of their ability. That means learn more and earn more! Frank writes with a voice that resonates with his selling presentation audiences, because he brings a sense of passion and joy, coupled with the serious aim of making one’s sales life easier with practical applications. Did you ever notice how the successful people seem happier than the bottom crowd who often complain about their work? —Jack Mitchell, CEO, Mitchell’s/Richards (Westport/Greenwich, CT) and Mitchell’s/Marsh’s (New York) and best selling author of Hug Your Customers and Hug Your People.